Exclusive: Is Spotplex a Better Digg? A new site called Spotplex launched today that arguably sorts news in a better way than Digg does. I’ve been testing the service for the last couple of weeks and like what I’ve seen. The resulting home page on Spotplex looks a lot like Digg, showing very popular content. Popular stories are ranked under the “popular” tag. Upcoming stories (the default view) are under the “latest” tab. Readers can also view stories based on popular current tags being used by publishers, and can view a ranked list of top publishers here. The service is still very much in beta. For now only a handful of blogs have been included. The site itself is open for anyone to read stories, but only a few blogs are included so far. The company will be bleeding in new blogs over time to avoid strain on their servers. 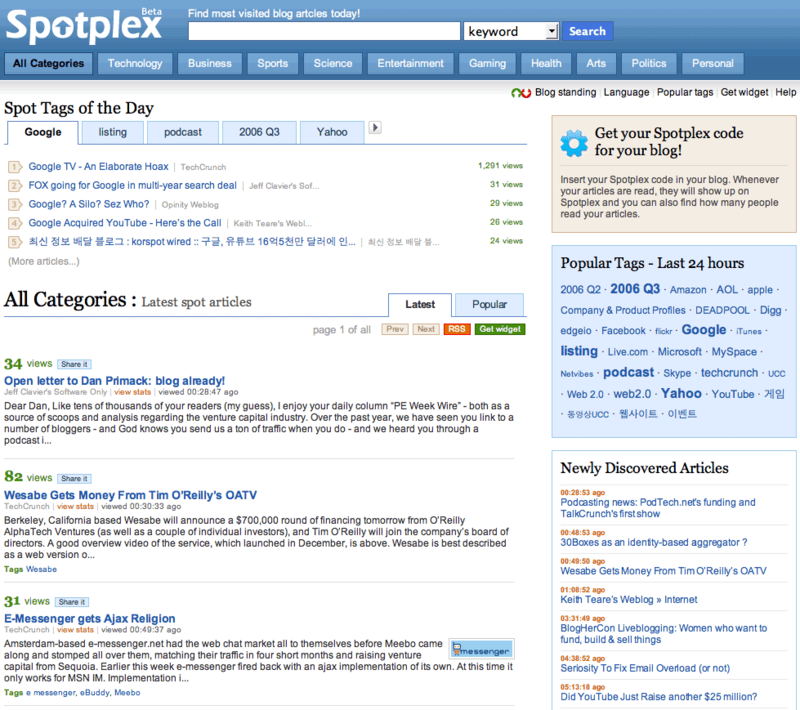 To kick things off they’ve agreed to allow up to 1,000 blogs in to SpotPlex. If you want to be included, just email “signup@spotplex.com.” The first thousand requests will get in right away. Can Spotplex become as popular as Digg, or more so? I think it can if it evolves properly. Unlike Digg, Spotplex won’t have to deal with voting fraud. Spotplex will have their own unique fraud issues to manage, though. Another problem with Spotplex is the fact that large blogs and publications will dominate it to start just because they have large readerships already. To avoid this “the rich become richer” problem, I’ve suggested to Spotplex that the rankings be based on a publication competing with itself – so only very popular stories on TechCrunch (compared to average TechCrunch traffic) would get to the Spotplex home page. The Spotplex team has said that they’ll be tweaking their algorithm constantly after launch based on real data they get from the beta. Spotplex is a spinoff of another startup, Opinity. The founding team includes Doyon Kim and Young Jun Pack.